Want to learn how to completely disable Bixby on the Galaxy Note 9? You’re out of luck because it’s not possible. We have guides on how to disable the assistant completely on previous devices like the Galaxy S9 but Samsung has made a subtle change to ensure that Galaxy Note 9 owners keep stumbling on Bixby, whether they like it or not. Granted, Bixby has its strengths, but many users just don’t feel the need to use it. If they are already relying heavily on the Google Assistant then one can understand why they don’t want to put up with a second virtual assistant. Samsung launched Bixby with the Galaxy S8 and the device had a dedicated button for the assistant. That button has since been a permanent fixture on all of the company’s flagship smartphones. Samsung doesn’t let users remap the button so it can’t be used for anything else. While it was previously possible to disable the Bixby key so that it does nothing when pressed, that’s not possible on the Galaxy Note 9. The key could be disabled by launching Bixby and tapping on the gear icon at the top which revealed a toggle. 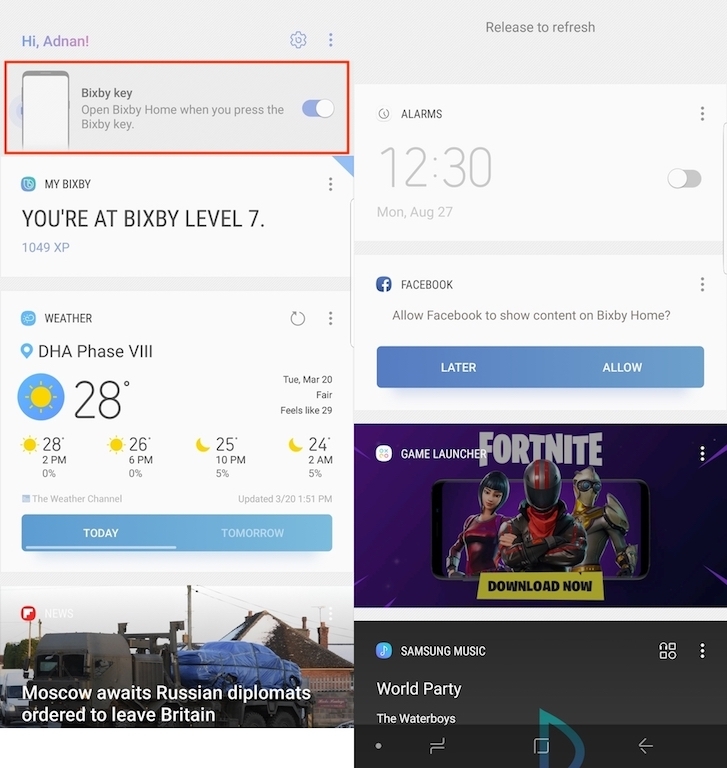 When turned off, the key wouldn’t open Bixby Home when pressed. You’ll find no such toggle on the Galaxy Note 9, just a gesture to refresh Bixby Home. This is likely going to irk many Galaxy Note 9 users because they have essentially been forced to live with Bixby. The placement of the buttons might see them accidentally pressing it often unintentionally. We also feel that the buttons are more sensitive so it will be difficult to avoid Bixby. We were surprised when we didn’t see the option on the Galaxy Note 9 and thought that perhaps it may arrive by way of an update once the handset is released. That hasn’t happend as yet but the possibility exists that Samsung could add this option once again in a future update. If you just can’t stand it, you can always pull out the Bixby button. 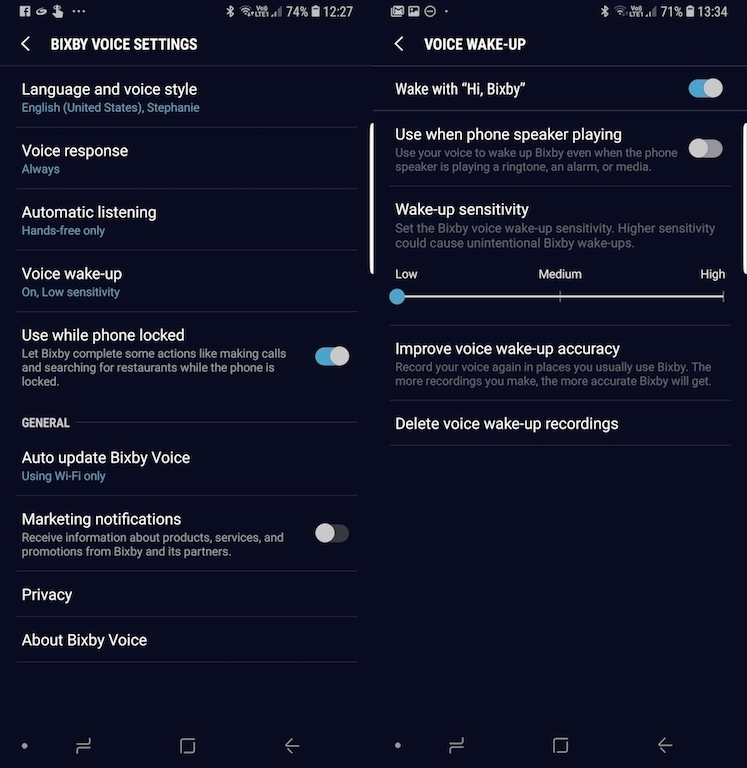 While you can’t fully disable Bixby on Galaxy Note 9, it’s possible to prevent it from waking up whenever you say “Hi, Bixby.” The toggle can be found inside the Voice Wake-Up section of Bixby Voice Settings menu in the Settings app. Turn off “Wake with “Hi, Bixby” to disable voice wakeup. Or, you know, just don’t say “Hi, Bixby” in the vicinity of your Galaxy Note 9. The key isn’t the only way you can open Bixby Home. Swiping to the left of your home screen brings it up as well. To prevent it from being launched after an accidental swipe, just tap and hold on any empty section of the home screen. Keep swiping to the right and you’ll find the relevant toggle in the last panel. A second chance for Bixby? Should you give Bixby another chance? Samsung has made some improvements to the assistant on the Galaxy Note 9 after all. There’s a new interface for Bixby Voice and the company claims it’s better at processing natural language. This will lead to quicker response times. Bixby is also better at making recommendations based on the user’s preferences and its integration with other apps has been improved as well. Before you set on your quest to disable Bixby on Galaxy Note 9 as soon as you take your new phone out of the box, perhaps give the assistant a few days and see whether the new changes make you want to use it more. If not, tough luck, it’s not like you can completely disable Bixby on Galaxy Note 9 anyway. Happy with my Bixby button. I find it very handy. Well, I can disable Bixby but not officially. You can use App named bxActions (no promotion, only for public welfare) to remap the key from Playstore. I am using it to launch Camera and it is working like charm.